Rated 5 stars to the review. No doubt you guys took long to compile this exhaustive review. Is sheet metal thickness such a big concern that it is highlighted so often in multiple threads. Also i think ford has gone the mass consumer way and not enthusiasts way for handling. Superb review as usual !! The Tata Indigo had a foldable rear seat and the boot was accessible from the rear seat. You had to have a flexible mid section to do this. However my Logan did not have this feature, but had a flat steel section behind the seat, that was supposed to be a "Boot intrusion protection" feature. I think this prevents the contents of the boot, sharp tools, etc. into puncturing the rear seat and thereby protecting the rear seat occupants, in case of a rearward collision. But does the Ford Aspire have such a feature in the boot?. I am not able to see such a flat steel plate in the boot. Flogging Ford for thickness of metal is incomprehensible. When haloed H does that, it is termed as safety feature, aka, crumple zone but when Ford does it, it takes a bashing. I have dropped an email to Ford India to check whether up sizing would void the warranty? Also asked whether Ford is planning to provide the bigger tyre sizes / alloys as an option to the customer. Will post the response as and when i get it. The side doesn't have any crumple zone , so thick metal is needed. The H might be haloed for some but for me it was, is and always will be a tin can on 4 wheels. The argument that crumple zones in a Honda make it safe is stupid. Fords, Skodas and and Fiats have equally good or I would say better crumple zones than Honda or Toyota. The crumple zones + thicker metal provide better safety in accidents for the Euro and American cars as seen in numerous cases in the accidents thread. As a owner of the old Figo right now and having purchased one because of the strong build, I would move elsewhere if the new figo/aspire is not solid. If aluminium doors are used like luxury brands then the lightness wouldn't bother me because aluminium has stronger strength than iron despite being light. Last edited by Ragavsr : 21st September 2015 at 23:19. The side structure of a car has been improved by putting some energy absorbing materials in the doors, pillars, subframe rails, roof and seats. Those side impact materials increases the stiffness of the doors to absorb and distribute the energy from the impact.The doors have internal stiffeners and beams to help resists inner intrusion. To help support the door beams and to transfer loads, most doors use reinforced hinges and latches. As for the body structure, unlike the rear and front that gives any possibility of absorbing energy at this point by means of material deformation, this area must be made steady as possible so that the damage in passenger compartment will be minimal.The side body structure of the car should help reduce inward intrusion into the survival space of the occupant and thus decrease interference with the side airbag’s performance. Some cars have subframe members found far inboard from the car’s side, and minimal strength partially- reinforced rocker sections, therefore there is a structural space in the middle body section where the passengers are located. That space can allow the unnecessary inward intrusion into the occupant and lessen the effectiveness of side airbags and other safety features. A sturdier front seat with lateral stiffeners in the seat base and seat backrest and H-point can also help reduce intrusion in side impact crash. Your usage of term "solid" leaves me confused. Ambys and Premier Padminis were solid cars too. or by "solid" you mean safe? If that's the case, then you have 6 airbags equipped vehicle - isn't that sufficient safety when coupled with other safety features (high strength steel cage being one of those) integrated in the car? Even with the possibility of corrosion, steel is harder than aluminum. Most spinnable tempers and alloys of aluminum dent, ding or scratch more easily as compared to steel. Steel is strong and less likely to warp, deform or bend under weight, force or heat. I am pretty sure it did have a couple of unpainted metal bars crossing behind the seat back. I don't know what's the purpose of this. By the way, usage of iron in car panels was probably discontinued several decades ago . I meant steel not iron. Whether it is the thick metal or reinforcements to the passenger cabin, the Euro and American cars don't allow the passenger shells to crumple where as we have seen the passenger cabins crumble in numerous Asian cars. We have seen so many fiat puntos and lineas come out of seriois accidents without any major injuries to occupants . I am not a too technical person even though I am an engineer by my parents' choice . Thats why I ended up in banking. 6 airbags . I would prefer being in a Skoda or Ford with 2 airbags than a maruti with six airbags. To clarify about the old world cars like amby or premier, they don't have crumple zone. I might be wrong but a strong build quality + good crumple zones is what makes a car safer. The aluminium vs steel debate isn't settled yet. But seeing the widespread adoption even in workhorses like the Ford F150 pick up which is the highest selling car in the United States by a huge margin, they must be right. Probably they have started using alloys of aluminium to increase stiffness but this is just speculation. 2. Why the Sales Person at Honda says that the integrated headrest in cheaper Amaze has been provided for whiplash safety while the same company provides adjustable headrest in all upper end models? 3. Why occupant safety standards are not common across car manufacturers like emission norms? If we consider the case of India, why there is a need to reinvent the wheel instead of adopting international best practices in occupant safety? Who's salary is getting justified here from the exchequers money? Last edited by i74js : 22nd September 2015 at 12:23. Great review Aditya and Tushar. The eye for detail is awesome, as always! Ford has done a great job in offering airbags on all variants. Good to see steering mounted controls, telephony, fog lamps etc in the mid variant. I expected them to provide ABS too here (like they did with the EcoSport). And now the indicator and wiper stalks are India oriented. Everyone seems to agree on the tyres being small. To be honest, I am not sure how Ford will handle warranty incase of an upsize. I have upsized my ride to 185/65 for my Fiesta aka Classic, the main intention was to improve the ride height as it used to scrape all the humps in Bangalore with more than 2 on board. 175/65 which came from the factory did its job fairly well, but then it had 31 horses less. Now, . 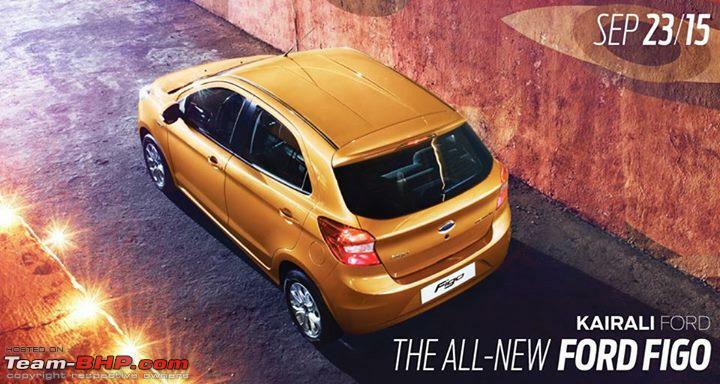 Saw this posted on the dealers FB page about the launch of Figo.Is the launch tomorrow? There there.. you said it..
Figo Aspire T+ is offering 6, 2 more than you asked for. But that makes me ask you, why did you decide to move on? Of course its your personal prerogative, but your preference mentioned above, and the assertion to move on yesterday doesn't add up. I think we are talking about the same thing - just that I am looking beyond the thickness of sheet metal and focusing on other parameters which go on to make a car "solid". Er, it is the best selling truck, no offence. Three options in 195/60/R 14. MRF ZLO ,Michelin Energy XM2 and Continental CPC 2.0,which would be a better option,mostly will be driving on good roads. I love corners, so would prefer very grippy ones. I use XM2 for my Zen and like it except that they are a bit soft. Have no clue about ZLO, but from the reviews it seems good enough. Same with CPC 2.Hope the experts could help me out. Being a first time owner of Ford and knowing some horror stories from past. I was just being careful and asked them if I upsize will it effect warranty. Ford is back with a bang. Extremely impressed with the Aspire for the following reasons. I hope, we ( Indians ) are mature enough to appreciate this well designed car. The sheer amount of Eco Sports sales and appreciation for the new Aspire says a lot about the way Indian buyer is maturing surely and steadily. I think all the gimmicky brands are going to have tougher times ahead. So be it! May the more superior Automobile reign!! The Ford Aspire might be offering 6 airbags but I am assuming the not solid build quality will result in the crumple zone extending to the cabin just like a Maruti or Honda. Given the fact that there are still structurally solid Fords(Ecosport), Skodas, Fiats, VW , I would skip the aspire. If F150 is counted as a truck then the Fortuner is too. Te F-150 for all practical purposes is used as a passenger vehicle with an open third row over there .what with the luxury trims with features rivaling german luxury brands dominating the sales, and they cost over 50000$ similar to BMw 5, Audi a6. I would pick a luxury pick up truck over those germans any day. Unless, the platforms exclusively designed for India like the Figo/Aspire platform, Brio/amaze platform are made to go through side impact tests, we will never know the truth. Last OT post. Will refrain from further OT about build quality.